I have previously reviewed the Toshiba Canvio Basics 2TB last year, and recently I have been checking out the advanced model which comes in 1TB, 2TB, 4TB sizes, with my sample being the 4TB model. This is a USB3.0 drive with a theoretical transfer rate of 5 Gb/s2, though, in reality, it will be nowhere near that due to the transfer speeds of mechanical hard drives. Functionality-wise there is not a great deal of difference between his and the basic model, they are both portable hard-drives, and they will both perform about the same. The Advanced model has a sleeker look with a piano gloss finish, it does look good as far as a hard drive goes, but it is still just a rectangular block, build quality feels excellent too. The drive comes with Toshibas own backup software, and you can password protect the drive. I suspected the software could be downloaded and used on any storage, but this is not the case. You can download and install it, but it will only work on the correct drives. Probably the most important difference is that the Advanced has a 2-year warranty, while the basic has a 1-year. There is not wide availability in the UK for this yet, but you can get it on Amazon through import for £91.59 + £3.86 UK Delivery. I suspect when there is proper UK stock the price will drop a little. In comparison, the basic model costs £85.99, so you pay around a tenner more for the advanced model with its longer warranty. Performance is good, with the limitation being that a maximum speed a mechanical drive can achieve. It runs at 5,400rpm which is standard for 2.5” external drives. With Crystal Disk this achieved marginally better write speeds but lower read speeds than the Basic model, it is a small enough difference for it not to be an issue though. Connecting via USB3.0 I was able to transfer a Windows ISO at 125MB/s consistently. It is small file transfers where speed drops significantly, as is the case with all drives. Copying a website backup over which was 700MB but with 10,000 files the speeds were around 2MB/s-10MB/s. 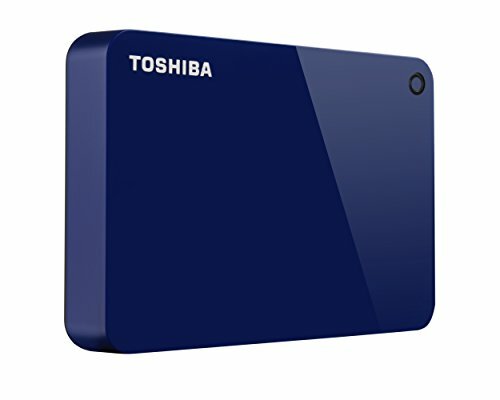 This is another great drive from Toshiba, it performs as advertised and isn’t priced excessively above the basic model. If you are buying this specifically as a backup drive the extra cost could be worth it for the software, however there are plenty of free alternatives. If this is your primary backup drive and you are doing a large number of writes, the extra one-year warranty could be worth it too, though you would obviously still need a secondary backup if there was a problem with the drive. Overall there is nothing to fault about this, it is a good drive, and I would always recommend having at least one large drive for local backups, and this fits the bill well. Personally, as I am a northerner and tight-fisted, I would be inclined to get the basic model, and that model still offers great value in comparison to competing brands.